Machine used to create a mixture from a shielding gas (e.g. SO2, SF6, HFC...) and an inert gas (carrier gas e.g. Ar, N2) for the protective gassing of a magnesium melt. To prevent a reaction between the magnesium melt and oxygen (air), the melt surface is completely covered with shielding gas. The shielding gas is mainly made up of a carrier gas and the actual shielding gas (e.g. SF6 oder SO2). The preparation, i.e. the mixing and regulation of the gas amounts added takes place in the so-called shielding gas mixing machine, which can be designed for both stand-alone systems (for a magnesium furnace) or central gas mixing machines (for more than one furnace). The amount and concentration of the shield gas can be chosen variably depending on the operating condition of the magnesium furnace (changed automatically during the casting process, e.g. production, idle, melting...). The parameters (set values) can be adjusted at any time; they are entered at the central control point (furnace control panel). A highly accurate and constant regulation of the amount and concentration of the shielding gas mixture. The automatic switching to a reserve bottle (bottle empty warning). The monitoring of all gas temperatures and flows. The central display of errors and notifications on the furnace’s control panel. The assurance of a safe melting operation and consistent casting process. In the case of an error, it is possible to carefully switch to the emergency operation (for safe cooling of the magnesium melt) - also in the case of a power cut. 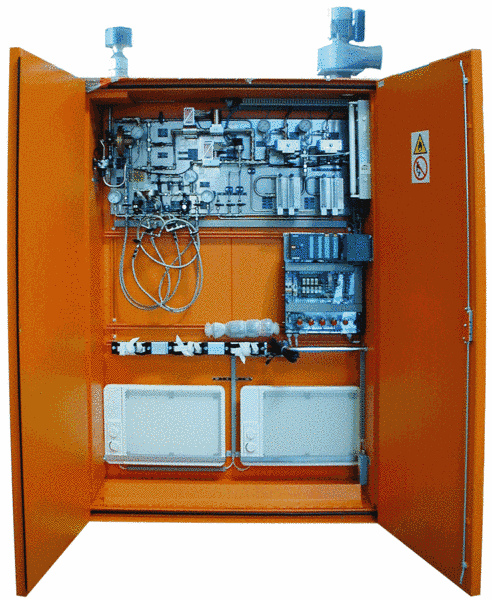 Regulated cabinet heating on the inside (only for SO2) in order to ensure safe operation even at low ambient temperatures. In gas mixing machines which use SO2 (toxic) there is an integrated gas sensor which automatically starts an extraction ventilator in the case of escaping gas (leak); a warning is also shown on the control panel.